The last audiobook I listened to on my trip a couple weeks ago was Natalie Babbitt’s Tuck Everlasting. At three hours long, it was just right for the last bit of the drive. This is another one I came across on iTunes, and I thought it would be an interesting trip down memory lane. Winnie Foster is a precocious, curious, and bored ten-year-old whose family is stern and protective, but they do love her. One day, Winnie decides to run away and is exploring the woods near her home when she comes across a boy gulping water from a spring. She says she’s thirsty and wants a sip, so the boy, Jesse Tuck, spills his family’s secret—that they are immortal after drinking from the spring. His family takes Winnie back to their home to explain their story, and why they’ve found immortality to be more a curse than a blessing. Meanwhile, a mysterious stranger has been following Winnie, plotting to make a fortune off bottling and selling the magic spring water. As I was listening, I realized I had nearly completely forgotten the story. I remembered the characters vaguely, and certainly Jesse proposing to Winnie, asking her to drink the water when she turns seventeen so they can get married and she can live forever with the Tucks. I also remember the ending… which—although it’s an old book—I don’t want to spoil… but I remember thinking it was an affecting and heartbreaking yet appropriate conclusion. 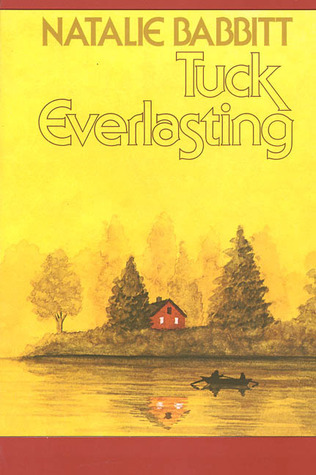 Tuck Everlasting still had the same wistfulness that I enjoyed in my childhood, with its thought-provoking premise and magical realism. Babbitt’s writing is lovely, with beautiful imagery of the surroundings and good use of metaphors. I did not remember the plot much, even the lengthy discussion of the pros and cons of immortality and the Tucks’ history. I had especially forgotten the intense conflict between the Tucks and the man in the yellow hat. It is a rather dark story for a children’s book, but anything dealing with immortality must also touch on the reality of death. As an adult hearing it again, I was a bit shocked by Jesse’s boldness in proposing to Winnie—merely ten years old—when, even in the body of a teenager, he was actually over one hundred years old. Are we to believe that although their bodies stopped aging, their personalities didn’t naturally age? That Jesse’s scores of decades in this life had no effect on his maturity? That seemed odd to me. This is a problem with the length, I believe. Perhaps if it were a longer book, with the Tucks visiting Winnie over several years—that would give Jesse and Winnie time to develop a real relationship. Maybe it was just Jesse, though—the rest of the clan seemed wiser. A longer story would allow for more plot and character development. The narrator of this audiobook version, Melissa Hughes, has an expressive and articulate voice. She was pleasant to listen to and capably handled the multiple characters with slight nuance. My one minor complaint with her interpretation, though, is making Mae and Angus Tuck sound perhaps more elderly than needed. Listened to audiobook on July 16, 2012. This entry was posted in books and tagged audiobook, children's literature, fiction, magical realism, science fiction by kristin @ my little heart melodies. Bookmark the permalink.